Info "Rub the magic lamp to free the genie! Hmm...wealth, fame, or a swimming pool full of custard?" Wishful Thinking is a microgame found in the Dance Club Rub stage in WarioWare: Touched! 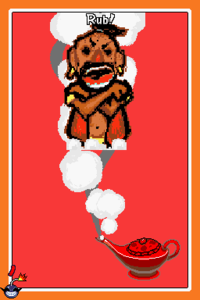 The objective of the game is to rub the magic lamp to make the genie, or occasionally a wolf appear. 1st level difficulty: The player must rub the lamp for a short amount of time. 2nd level difficulty: The player must rub the lamp for a slightly longer amount of time. 3rd level difficulty: The player must rub the lamp for an even longer amount of time. The player must score 10 points or more to clear the microgame. This page was last edited on October 16, 2018, at 22:54.